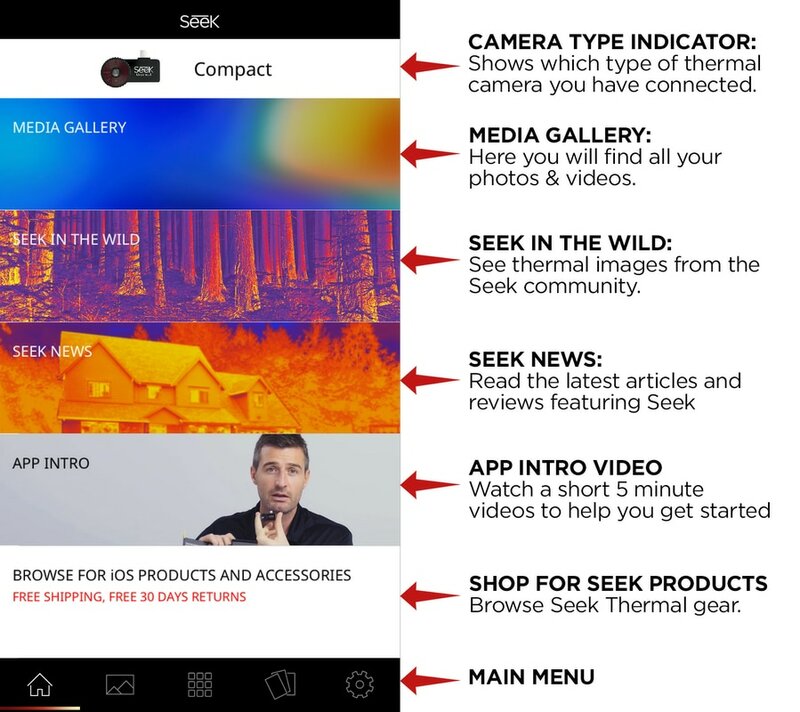 ​Welcome to the official Seek Thermal App! Let's take a few minutes to quickly walk through the basics of the App and learn how to use your device. We want you to have a great experience with your Seek product. By sharing your name, email, and serial number, you enable us to send you product updates and tips and techniques. We can also expedite your warranty inquiries by knowing when and where you purchased. Country information helps us to provide better local product support. This one-time registration takes 30 seconds or less with WIFI or Cellular connection on your phone. You DO NOT need to remain signed in to use the product after registration is complete. We respect and protect your privacy. We do not share your personal data. You can change your communications from Seek at any time by logging into your account. *Product registration is not required and you may choose to skip this set by selecting "Opt out"
The Main Menu icons always appear at the bottom of the app screen. The Thermal Modes icon in the center of the menu will change to represent the current Thermal Mode selected. NORMAL MODE: Default mode that maximizes thermal image consistency using auto exposure control. FULLFRAME MODE: Displays all temperature data for maximum clarity. SPOT MODE: Use the crosshair to pinpoint a specific temperature. HI/LO MODE: Pinpoint the highest and lowest temperatures. PAN & LEVEL MODE: Easily set and lock a temperature range to display the maximum thermal information of any object or scene. *Mode available for CompactPRO only. THRESHOLD MODES: Colorize temperatures that are above, equal to or below the temperature you set. THERMAL+ VISIBLE MODE: Experimental mode that allows thermal and visual imaging side by side in real-time. Easily swipe between photo and video mode. Swipe left to change from photo to video mode, and swipe right to return to photo mode.